Daly Industrial Supplies U19 Premier League: Rockmount 2 Midleton, 1. Daly Industrial Supplies U18 Premier League: Blarney United 1 St Mary’s 2. FAI Umbro Youth Cup second round: Leeds 2 Leeside 0, Everton 0 Kilreen Celtic 3, College Corinthians 0 Macroom 5, Carrigaline United 0 Rockmount 3. Daly Industrial Supplies U18 Premier League: Douglas Hall 2 Mayfield United 0. Daly Industrial Supplies U18 League 1: Rathcoole Rovers 2 Mallow United 6, Greenwood 1 Douglas Hall 2, Ringmahon Rangers 0 Ballinhassig 3. Ted Healy Cup first round: Avondale United 5 Churchvilla 2, Bandon 4 Youghal United 3, Blarney United A 5 College Corinthians A 2, Carrigtwohill United 1 Rockmount 6, Castleview 7 Midleton A 4, College Corinthians 6 Fermoy 0, Douglas Hall 0 Ringmahon Rangers 9, Evergreen 0 Avondale United 6, Midleton 3 Passage 2, Riverstown/Brooklodge 2 Leeds 6, St Mary’s 5 Ballincollig 1. Daly Industrial Supplies U19 Premier League: Fermoy 0 Castleview 0, Rockmount 4 Blarney United 5. Daly Industrial Supplies U19 League 1: Avondale United 8 Lakewood Athletic 5, Ballincollig 1 Strand United 1, Ringmahon Rangers 1 Douglas Hall 4, Wilton United 1 Greenwood 2. AOH Cup 2nd Round: Lakewood Ath 1 Cathedral Celtic 0; Springfield 1 Knocknaheeny Celtic 3; Glen Celtic A 5 Waterloo C 0. Saxone Cup Semi Final: Crescent Ath 3 Donoughmore Ath 0. Premier League: Coachford 3 Killumney Utd 0; Grattan Utd 2 Pearse Celtic 1; Greenwood 1 Blarney St Ath 1. 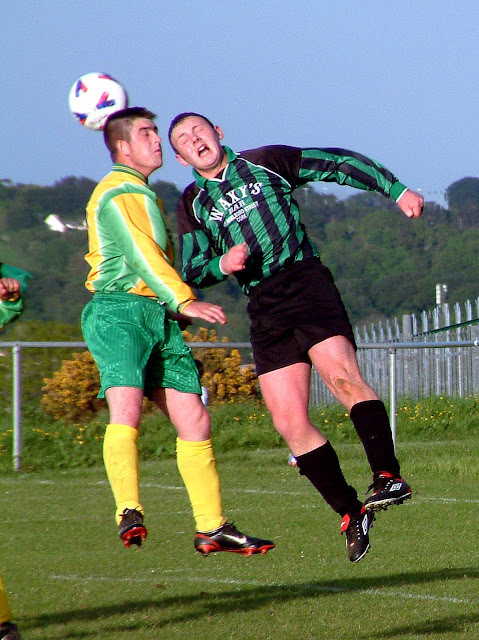 Premier A League: Village Utd 2 Innishvilla 2; Dillons Cross Ath 2 Macroom 1. AUL 1: Kanturk 6 Bohemians 2; Strand Utd 3 Fairview 0. AUL 2: CFC Banteer 2 De Courcey Albion 2; Newmarket Town 5 Cloughduv Celtic 1; Leeview Ath 11 Ballinhassig 2; Blackpool Celtic 0 Ballincollig 3. AUL 2A: Grangevale 3 Watergrasshill Utd 3; Glenthorn Celtic 2 Glanworth Utd 0; Hillington 2 Shandon Celtic 6. AUL 3A: Carrigtwohill Utd 4 Temple Utd 1; City Wanderers 2 St John Boscos 2; Grattan Utd 2 Pearse Celtic 4. AUL 3B: Tower FC 3 Strand Utd 2; Waterloo v Innishvilla (off); Killumney Utd 1 Coachford 3; Bweeng Celtic 2 Los Zarcos 3. Do you want to be in the running for the Murphy’s Irish Stout Team of the Month for November? Get your entries in to Henry Healy, 19 Inniscarra Road, Fairhill, before Friday, December 12th. Please note: If applicable, please include Friday, October 31 in your sequence of results. Corkbeg FC are looking for a challenge match this Saturday 29-November. Carrigtwohill's all-weather surface is provisionally booked for 12.30pm on Saturday afternoon.